Capt. 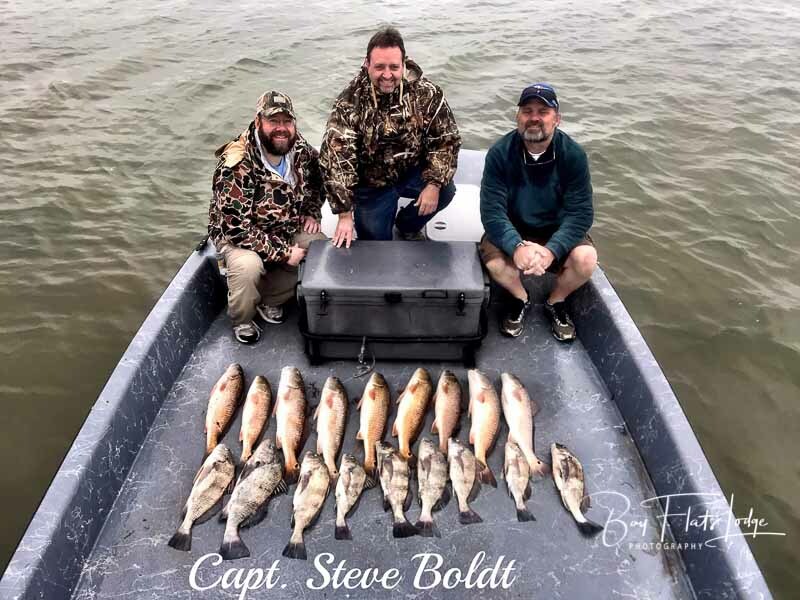 Todd Jones– Today consisted of a solid morning of “fun fishing” with good buddies! Several trout in the 22” range. Somehow our math skills were a little lacking, but it’s always good luck to leave one out there for next time! Wade fishing with lures should continue to improve into February, March, and April, so call (888) 677-4868 today to take advantage of a $25 per/person discount on food and lodging when you book a wade fishing trip (with lures) for any day in February. Capt. Steve Boldt– There was a definite chill in the air, but this morning’s crew got the job done. For being a half-day trip, they managed a very descent box today with a three-man redfish limit and several black drum to top things off. They’ll all eat well when they get home! Capt. 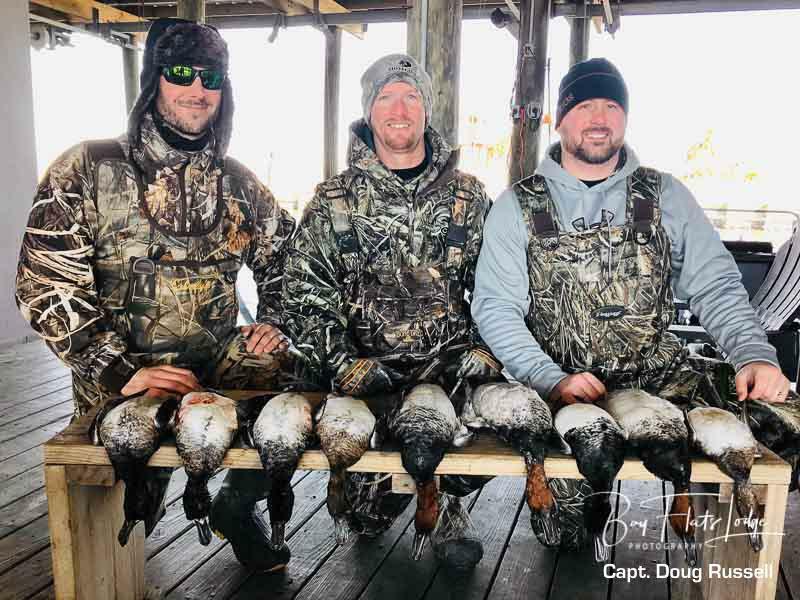 Doug Russell– A cold front blew through town overnight, so by shooting time this morning things had cooled down quite a bit as the thermometer dropped into the 30’s. The morning didn’t turn out being one of the absolute best days of shooting for us, but it certainly wasn’t the worst either with nine birds. Hoping for more cold weather soon! 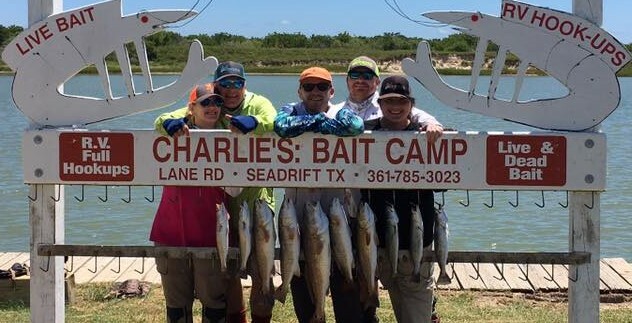 For the next couple months along the midsection of theTexas coast, speckled trout anglers can prosper when keying on mud and grass in protected coves, area drains, small bayous, and narrow channels that lead out of the back lake areas that are situated out on Matagorda Island. Many big wintertime trout have been hooked while slowly working natural and artificial baits in just such places out on “the Island” during February and March. However, in order to catch one of these big fish, you’ll first have to target them. These “big gals” can often be persuaded to eat a number of different artificial baits this time of the year, but some types of lures certainly outperform others. One steady producer that anglers can usually depend on is the slow sinking and suspending baits. These are the ones like the original plastic Corky, the Corky Fat Boy, and the Corky Devil – and now the newer line of Soft-Dine baits – of which all sink slowly toward the mud and grass until messaged to return toward the surface via a smooth, minimal motion of the rod tip. Some of the older, more popular suspending baits, depending on the brand and model (the Catch 5, Catch 2000, and the 27MR MirrOdines), will automatically position themselves in the water anywhere from 6 to 12 inches, or even two feet, below the surface. They can generally be retrieved at a steady pace with an occasional slight twitch from the end of your rod tip throughout the course of the retrieve. They’re nothing short of fun, and can be downright effective at catching big cold-water trout when worked properly amongst the right conditions. Top waters will also produce during the next couple months, with some of the favorites being any of the larger surface walkers by MirrOlure, Heddon, and Rapala, to include the newer ones made available by the Paul Brown line of lures. One reason to throw top waters this month and next is that you’ll need to be presenting bigger baits because big trout are usually looking for a large meal right now, like a single (big) mullet for example. You’ll also find that these heavier top water baits are quite easy to toss and to retrieve in high-wind conditions that we’re so often faced with during this time of the year. Large top water lures should definitely have a permanent spot in your wintertime tackle box, as they have certainly yielded full stringers on many wintertime occasions. If you prefer hunting your big trout this winter using soft plastic tails, then you might think seriously about lightening your overall presentation. Cold weather trout tend to move rather slowly during this time of the year, and because of this you should look at using a 1/16-ounce lead-head with your plastic tails versus the 1/8-ounce head that you may typically otherwise throw. Granted, numerous and massive strikes in February may become few-and-far-between, but try not to get frustrated when the action’s slow. Just keep grinding, and remember that good things always seem to come to those who persevere the cold during wintertime! In closing, we’d like to remind everyone of our 2019 HUNT FOR TROPHY TROUT SPECIAL. From now through the end of February, wade fishing guests will receive a $25 DISCOUNT off their nightly lodging and meals each day. There are several February dates still available, but they’ll go fast, so don’t hesitate in phoning and making your reservations today…1-888-677-4868. Capt. Chris Martin, and his wife Deb, permanently reside in Seadrift, Texas. They are the proud owners and operators of Bay Flats Lodge, which overlooks the pristine waters of San Antonio Bay.